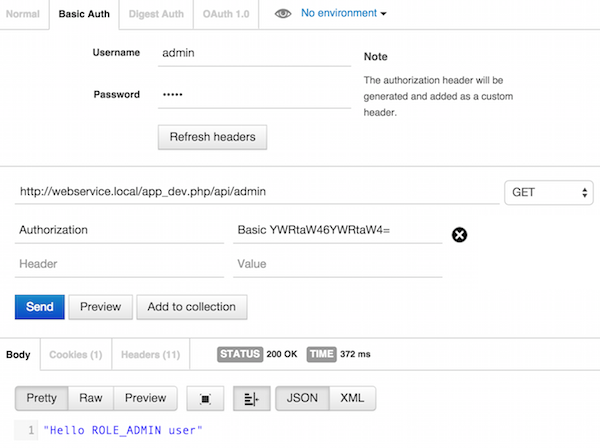 This is an API that can be consumed with basic auth requests and there won't be login or logout features. Users are allowed to access URIs that they are permitted to otherwise "401 Unauthorised" error gets produced. 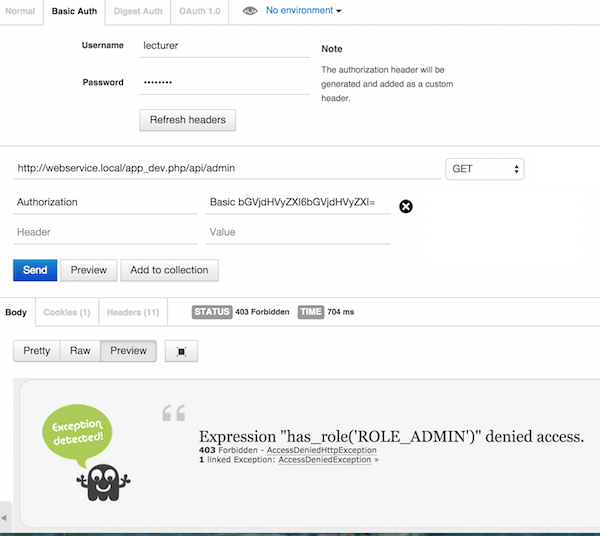 The users, credentials, roles and URIs are all defined in "security.yml". For more info, click here. 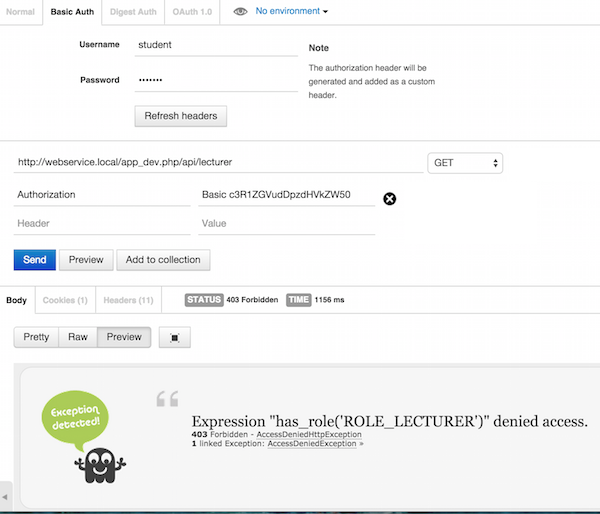 To assign multiple roles to a user, use roles: [ROLE_STUDENT, ROLE_LECTURER, ROLE_ADMIN]. Install "jms/serializer-bundle" : "1.1.0" with composer and add new JMS\SerializerBundle\JMSSerializerBundle(), to AppKernel file. As you can see below, unlike other two methods we didn't have to set @Security for studentAction method because, access control settings in security.yml dictates that logged in users (ROLE_STUDENT, ROLE_LECTURER, ROLE_ADMIN) can access to all /api/... end-points by default. To override this behaviour, we use @Security annotations. All the user roles can access to / so I won't demonstrate it here. Also, I won't show every single end-point tests here but you can trust what I say below. Forbidden access to all /api/... end-points. Can access to /api/student but not /api/lecturer and /api/admin end-points. 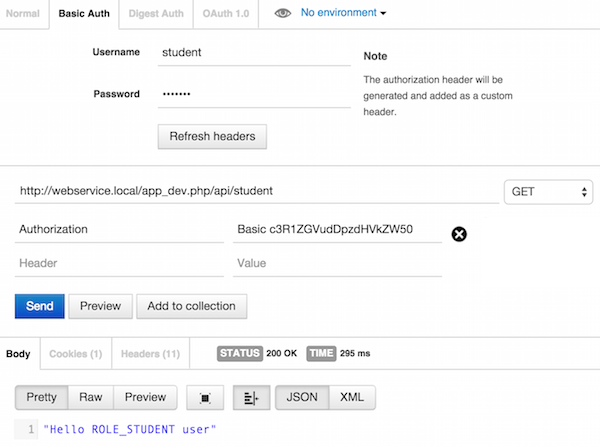 Can access to /api/student and /api/lecturer but not /api/admin end-point. 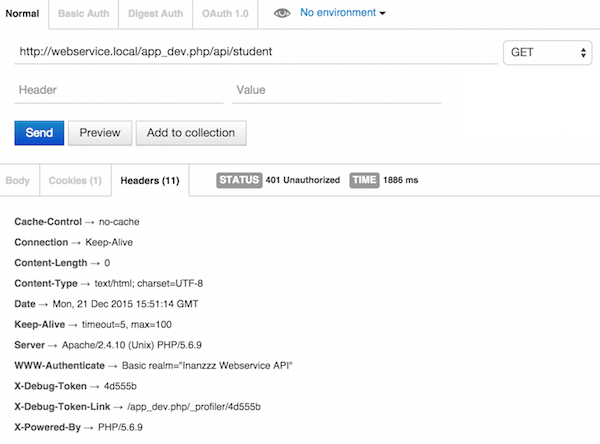 Can access to all /api/... end-points.